The immune system is a very robust “antibody factory” that consistently produces antibodies to fight infections and diseases by recognizing and targeting infected cells or pathogens (antigens). The emergence of single B cell antibody technology has enabled a new strategy for discovery of naturally occurring antibody drugs. The single B cell antibody technology produces higher throughput and higher coverage than the conventional hybridoma or phage display technologies. Most importantly, this technology also avoids the disadvantage of unnaturally paired heavy and light antibody chain displayed by phage. With our advanced technology and professional team, we have developed two methods for discovering single B cell antibodies. 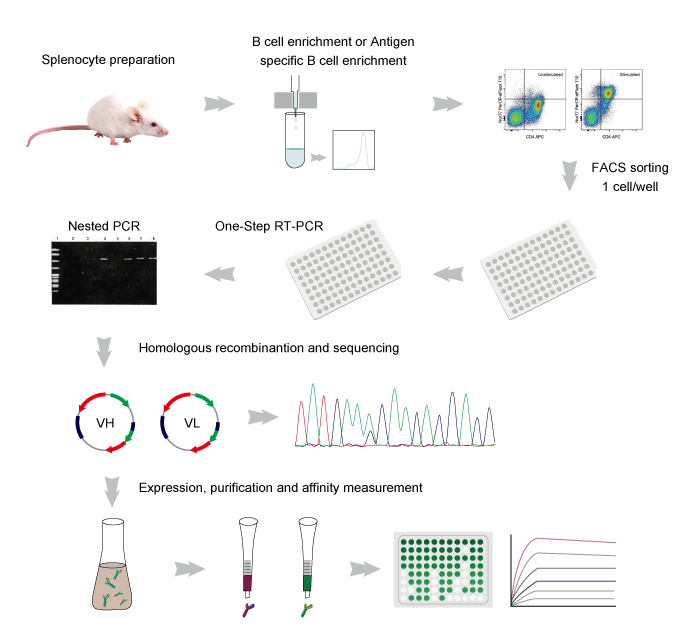 The first method is based on the antigen-specific single B cells sorting by Fluorescence Activated Cell Sorter (FACS), followed by RT-PCR amplification to obtain the target antibody sequence. The second method relies on the use of micromanipulators to select a single B cell of interest, then culturing the cell for further characterization. With these two complementary methods and our other custom antibody discovery services, we help our customers effectively find antibody drugs while saving both time and money.